Despite the distance, it was great all the guys made the finish line. Kind weather and pulling together as a team made the whole three days an enjoyable and very rewarding experience. Just one question remains: where to next?! An epic cycle for part-time cyclists! This was quite an undertaking for the Grimme guys. They ranged from complete novices to slightly more experienced cyclists, but no one had experience of cycling on this epic scale. Despite the enormity of this challenge, each member remained 100% focussed on achieving their goal: to raise as much money for Children with Cancer UK as possible. Despite punctures, blow outs and the support team getting lost on a couple of occasions, the ride couldn’t have gone better. Peter Mason (UK), Glyn Argent (UK), Dan Taylor (UK), Russell Button (UK), Chris Shipley (UK), Barry Baker (UK), Peter Stocks (UK), Neil Jackson (UK), Heine Hylleberg (SK), Per Rasmussen (SK), Henrik Pedersen (SK), Soren Lund Madsen (SK), Morton Mikkelsen (SK), Dirk-Jan Staple & Marcel Stubbe (Damme). Support Team Mark Addinall & Stuart Smith (UK). 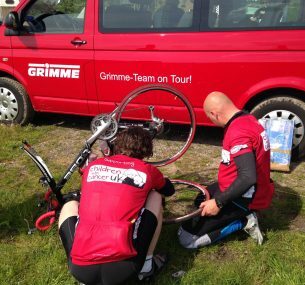 A big thank you to Team Grimme for taking on this epic challenge. They have now raised over £10,000 for Children with Cancer UK! 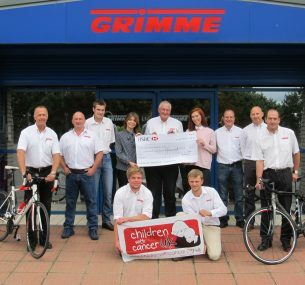 We are extremely grateful to all the employees of Grimme and for everyone who sponsored them.